Yep. I think the wood is rotted. Time to splice in a new piece. Also find where the water came from. That is my next project. After I get back from South Dakota (hope awning makes it there and back). How easy is it to expose that area? It looks like the water was coming in from that mount. The worst of it is at the mounting bolts. Thanks for the butyl tape info! I was going to use silicone. I'll pick up some tape from Napa tomorrow. It was pretty easy getting the panel off. Just TONS of staples. Unfortunately, I have a storage compartment on that panel. I think that also has to come off before I can remove the panel. Make sure it's the 3/4 inch wide butyl tape. When you you install awning mount screws predrill and coat the screw with Dicor caulk. The same stuff you use on roof seams. Got the new wood scabbed in this morning. A piece of pallet works great tomorrow morning, the panel goes back on and I can scratch this off my honey-do list. Next project is a clothes rack that mounts on the rear bumper. Hello, Mike13, I'm new here and I'm wondering how difficult is it to remove the outer skin so it goes back together "fairly " easily? It looks like a nice job by you, I like the repurposing of the pallet wood! Is the pallet piece screwed into the frame? or into the floor? Mike13 never responded...does anyone else here have any info for me as to how to remove the outer skin (without destroying it)? R&R of the aluminum siding isn't difficult if there aren't windows, doors or other items screwed in over it. Even then, it's not that it's difficult, just takes more time. Start by pulling the vinyl screw cover from the corner moldings. Then you will see the hex head screws that hold the moldings in place. Take out as many as you need to so that the molding can be lifted away from the siding section you want to remove. When the screws are out, gently lift the molding away from the siding with a blade or putty knife (about 2" wide is good). 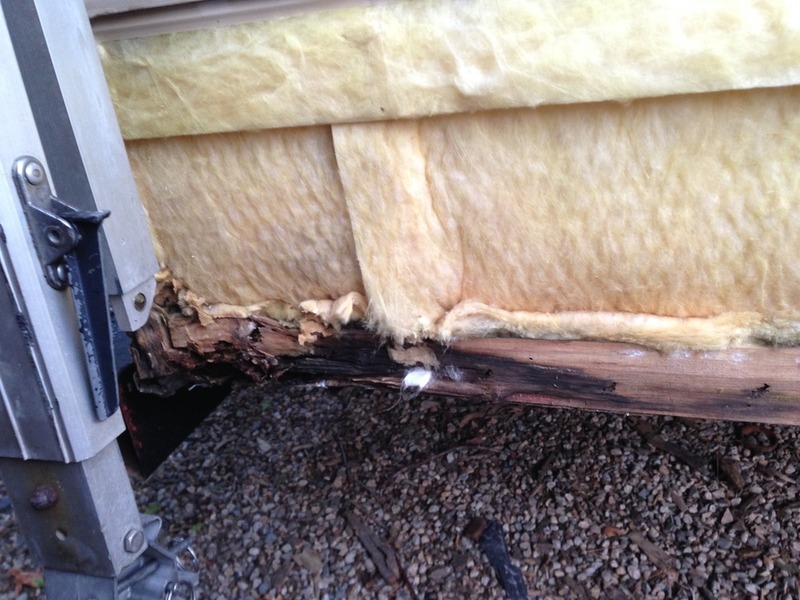 You'll be pulling against the stickiness of the putty tape used to seal the molding to the aluminum siding. Try not to kink the molding while lifting it. Then, clean off the old putty tape. You'll see steel staples holding the siding under the corner molding. Remove all you need to remove to free the siding. There will also be some staples where the bottom siding section wraps under the wall. 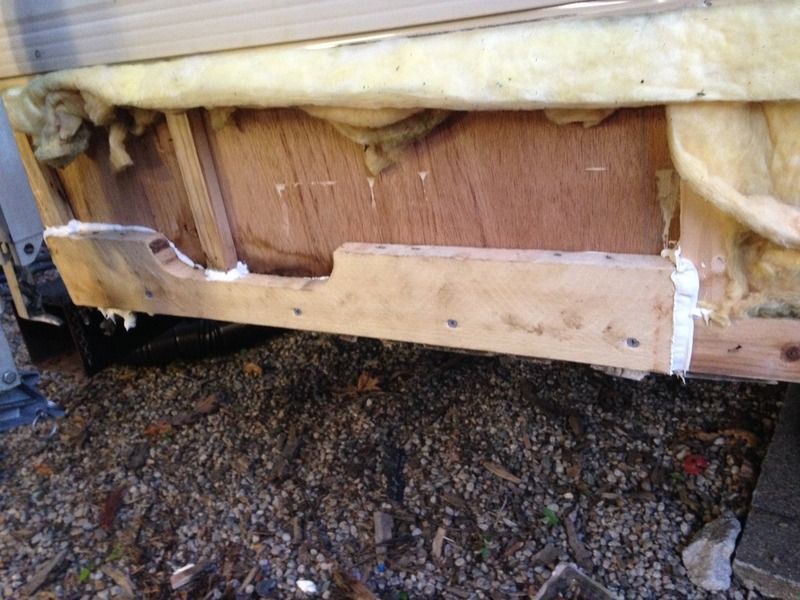 At the front or rear of the trailer remove the hex screws holding it in place. At this point, you'll be able to pull the bottom panel of siding down and away from the trailer. The next one up is held in with more staples in the flange that was hidden by the lower section. Remove sections as high as you need to go. Replacement is just the reverse, but now, unless you have a heavy duty staple gun, you can use flat headed screws to substitute for staples. I say flat headed, because if you use a screw that stands above the siding on the flange, the next panel down that hides them will be deformed by the screw head resulting in small bumps (ask me how I know this). Use 1-1/2" wide butyl tape to reseal the corners, screw down the corner molding, use the same butyl tape to replace any windows etc. that were removed and replace the old (or new if needed) vinyl insert and your done. Thanks, Rich. That's kinda what I thought, just needed verification...and a sunny weekend!